I don't have a clever way to begin this, so I will just begin it. I am going to be going another character post today, again for The Broken Blade. Today's is Trystan. Trystan is the only non-human in the group. He is an Elf who isn't originally from Nightshade. Trystan is a hundred - and maybe a few extra years in there but he doesn't like to talk about it. Elf age is a bit like Human, even though they live longer. If he was a Human he'd be twenty, so even though he's a hundred he isn't technically old for an Elf. All the Elves in Nightshade have light hair and fair skin, but the Elves where Trystan comes from have black hair and darker skin, he is therefore called a Dark Elf by many in Nightshade. 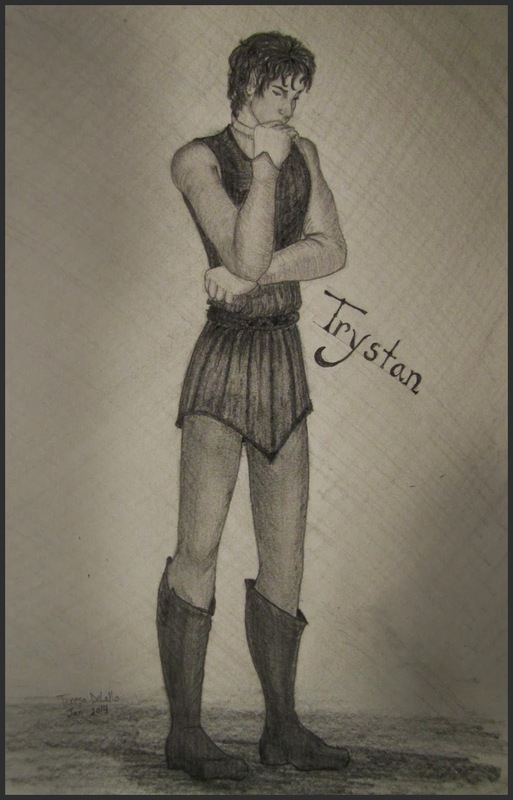 Trystan was sold as a slave and bought by BenArgon's father who freed him soon after he bought him. Feeling he had nowhere else to go - he is running from his past - Trystan stays with the family and when Argon's father dies he takes it upon himself to become Argon's mentor. This isn't easy, especially since Trystan has NO sense of humor and BenArgon annoys him a lot because he never takes anything seriously. Because of his temper, Trystan clashes with a lot of people he meets. He fights non stop with Fagan - another of the boys - and sometimes gets into fights with Striker. He hardly ever smiles and never acts like he cares about anyone, though deep down he is always concerned for the other boys' safety and does everything he can to protect them. Like all Elves, Trystan is skilled with the bow. He makes himself a long bow in the second book and he also carries a sword. He knows how to use the crossbow though, since it takes longer to load, he is not as fast with it as he is with his bow. Trystan is light on his feet and graceful, which amuses the other boys. He is very quiet and prefers to be left alone, but when traveling with six other boys this is next to impossible. He is determined to mold BenArgon into a warrior, though he begins to think this will never happen. I even have a snippet to share! Aren't you proud of me? Warning, it is a very rough snippet, but so far it is my favourite with Trystan. The solemn mood was shattered so fast Striker could have been convinced it had never been there to begin with. “Again?” Jaspart and Jespert demanded. “He does this a lot?” Ryder-Adair asked, throwing his head back to stare up at the now scowling Elf. Striker almost told him that wasn't true, he'd already tried it. But before he could Trystan scoffed and BenArgon darted up the bank. His feet sank into the snow near the bottom, but once he was past that he reached the solid part of the snow and stayed on top just like Trystan. “I told you so,” he taunted his friend. Then, he ran forward, somehow managing not to slip even though he couldn't see where he was going. “Look, I am an Elf!” he exclaimed as he ran. And now.............The best part of character introductions!! Isn't he fantastic?! I personally love his clothes - again, designed by Treskie. They're so Elven, in a manly kind of way. He sounds like a cool character. And I like his hair. And his name. And his elvish, yet manly clothes (that makes me giggle for no reason). Trystan and BenArgon sound a lot like Byron and Trindle. This is so fascinating! I loooove all the character names. I always love character posts. :) It's fun to get these little introductions. I write character sketches for my stories...but mostly that's as far as I get. lol. Characters are my favorite thing about stories. Which is sort of a 'Duuuh!' thing to say. But you know what I mean.